Brattleboro Museum & Art Center's 2016 Open Call NNE (North-Northeast) exhibition includes the work of twelve singular artists from Maine, Massachusetts, New Hampshire, New York, and Vermont. This year's open call drew over 300 responses from every corner of the Northeast. The subsequent curatorial process was guided by my observations and thoughts on the originality, technical proficiency, and depth of content of the works submitted. Although the works chosen are diverse in execution and subject matter, they reveal several broad approaches to art making that have allowed me to thematically link specific artists' work. I hope these overlying themes help put the works in a context that aids viewers in their appreciation and understanding. Rita Edelman's mysterious graphite drawings bring to mind tantric diagrams or hieroglyphs, but the artist creates them by taking rubbings off a wooden chair she has incised with carved lines. Casting a mystical aura, the drawings suggest meaning without ultimately offering any definitive answers—only questions as to their making and content. Can both of Graham Mears's large expressionist works included here be labeled history painting? The device of a painted ornamental "frame" in each work, together with a hint of narrative, suggests a reinterpretation of past events. 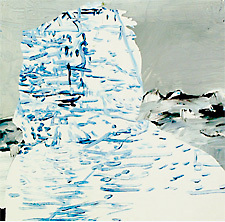 Mears has rendered his subjects in an inventive and painterly manner, combining purposeful gesture with the contingent. To the viewer, Barbara Hadden's layered northern landscapes alternate between spatial representation and flat, modernist abstraction. The figures present don't stand apart from the land but are part of it, dissolving both human and animal individuality into the natural world. Generated from photographic imagery (the artist is also a photographer), Hadden's paintings belie their origins through masterful paint handling. Don Williams's enigmatic ceramic sculptures alternate between biological form and aspects of the constructed, synthetic world. Beautifully glazed, the unusual compositions compel the viewer to circumnavigate them for full understanding. 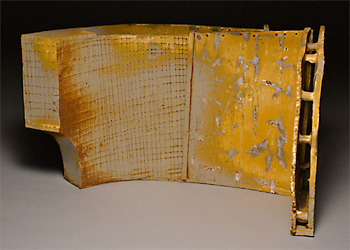 Often resembling deconstructed vessels, Williams's sculptures take their cue from the deep history of ceramic object making. Sean Gallagher's dramatic portrait paintings unexpectedly place their subjects in the landscape. Although the faces in these paintings fill the majority of the picture plane, the surrounding skies play an oversize role in conveying the psychology of the individuals portrayed. 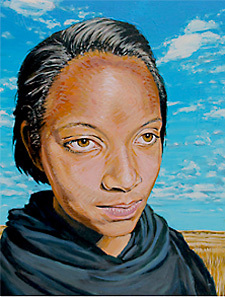 The expressions of Gallagher's subjects are both pensive and determined, and the changing weather that surrounds them only adds to the perception of their inner life. Tom Fels's large graphite drawings update the rich tradition of the depiction of antiquity, particularly of architectural ruins, in Western art. 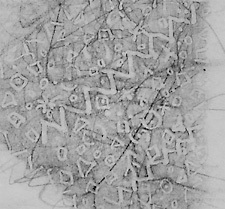 This tradition generally cast the past in romantic terms, but Fels's drawings bring to the subject a contemporary sensibility that is based more in technique than in speculations about what is pictured. The combination of an animated line with the delicate chiaroscuro of powdered graphite brings new life to subjects that are survivors from the travails of history. How can one define reality in an era when an increasingly large amount of visual information comes to us digitally? John Richey's fabric shirts are both depictions, and functional doppelgangers, of clothing he finds for sale on the Internet. Working from a digital photograph, Richey painstakingly renders his subject in watercolor, scans his painting, then sends it to an online service that prints fabric from digital files. The resulting garment has gone through a bewildering series of transformations that speak of the mutability of information. At first glance Marjorie Forté's installation of 90 small works looks like a collection of postcards. Closer inspection reveals that each object is a piece of paper with the date of creation above dashed lines of "text," all painstakingly sewn with thread and juxtaposed with a small found object. Created after Forté traveled to Kenya and experienced the reality of poverty in the developing world, each work is a daily meditation on the material richness of life in the United States. Kelly Popoff's painting "Barricade" depicts a heap of stuffed animals and dolls (or are they children?) piled in a school classroom. Initially radiating innocence, the image takes on a chilling note when interpreted through the painting's title. Popoff is posing her toy figures as prisoners of the current climate of violence, and her straightforward, folklike painting style only acts to heighten the tension between our notions of childhood and the reality of the daily headlines. Laura Kaye's watercolor "Lack of Judgment Day" is a poetic compression of the landscape through a sense of the geological and archaeological. 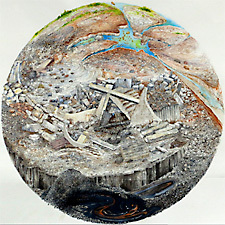 The artist's spherical, world-like image depicts what resembles the breakup of the ancient continent of Pangaea at the top, a wasteland of human-made detritus in the middle latitudes, and a southern hemisphere that is a cesspool of hydrocarbons. The horror vacui of Kaye's paintings accentuate the shrinking options we have in the face of a global environmental crisis. Every year thousands of paintings done by students in art school are discarded. 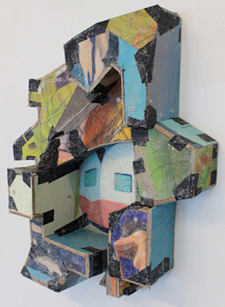 Carmelo Midili "mines" the canvas from these unwanted works, transforming it into three-dimensional constructions that utilize fragments of the students' original compositions. Midili doesn't try to hide his process: his sculptural objects revel in their making by featuring exposed screws and duct tape. New meaning is provocatively built on old meaning, echoing the process that categorizes cultural evolution. Cynthia Davis transforms old wall maps into objects that blur the boundaries between the empirical and the subjective and poetic. She tempers a map's hard reality of geography, history, and politics by grafting found objects and handmade textiles onto its surface. Davis''s placement of the found in a geopolitical context hints at the complexity that underlies the often abstract nature of cartography. The overall quality of the submissions reinforced my view that stubborn individualism is alive and well in the Northeast. Aldrich Contemporary Art Museum, Ridgefield, Conn.